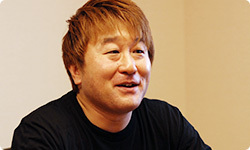 I’d like to ask some questions to Ono-san from Capcom; to the person behind Street Fighter IV.1 Ono-san, thank you very much for coming today. 1 Street Fighter IV: A fighting game developed by Capcom Co., Ltd. The arcade game appeared in 2008, and the home console version appeared in 2009. This title is the fourth in the series, but there is nine-year gap since the last release. Today, I’d like to ask you some questions about the Super Street Fighter IV 3D Edition2 game. In order to understand a product, knowing the people who made it is the best way. It’s very important to know what they experienced and what their motivations were at the time of making the product. 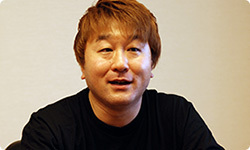 First off, I want to ask you how you came to know video games, Ono-san. 2 Super Street Fighter IV 3D Edition: The newest entry in the Street Fighter series, being released simultaneously with the Nintendo 3DS system on March 25, 2011 in Europe. When did you have your first experience with video games? The one I remember the most distinctly was with Space Invaders.3 My family always went out to the neighbourhood café and had breakfast on Sunday mornings, and that café had a Space Invaders game. 3 Space Invaders: An arcade game released by Taito Corp. in 1978. I think I was in Year Four of primary school. This might be getting a bit personal, but my father was an architect and my mother was working too. I went to cram school at the weekends and played baseball, so we didn’t really get to see each other all that often. So we decided that we would spend time together on Sunday mornings, and that’s what we did. My father, being an engineer, was also very interested in video games at the time since it was the latest technology. We had so much fun competing against each other face to face through video games. So, there was a “bond with dad” through video games, if you will. We didn’t really talk that much though, being just two guys on a Sunday morning. (laughs) But the kind of communication we had between us, and the fact that our competition was through something electronic, just made it very exciting all in all. So, your roots are based in competition. Did you become really good at it? Well, yes. I was able to follow fast-moving objects when I was young. (laughs) The thing I remember best was when more cabinets for Space Invaders started popping up in various stores throughout the neighbourhood. A community of players began to grow, and I asked around about gameplay conditions - things like, “What’s the timing to get the most points out of the bonus UFO?” I competed with my dad even more through that. Oh, right. Your twenty-third shot and every fifteen shots after that were supposed to get you a lot of points out of the UFO. And how did you have your first experience with home consoles? It was probably at the time Space Invaders and similar titles became LSI games that were playable at home.4 We didn’t have to stack up 100-yen coins on the café tables anymore. I also didn’t have to give my dad a back massage for two hours, either. (laughs) (Editor’s note: In many homes in Japan, kids often give their dads and mums back massages to receive spending money.) 4 LSI game: A large-scale integration game system. I remember how everyone would stack up 100-yen coins on the café tables, too. Yes. At the time, seeing those high school and college students with their 100-yen coins stacked up made them appear really mature to me. And when we got a home console of our own, my interests started to drift toward PCs. I started making games on computers with the idea that if I made the games myself, they’d be free! But computers were still really expensive at the time, and my parents wouldn’t buy one for me. By touching the display models at electronics stores, by making games, and by competing, I realised just how great games were. Eventually, the Famicom system was released, but I was a complete PC user by then. So, Famicom systems were nothing compared to PCs? I think I had my pride as a PC user. But when I saw a few of the games from NAMCO at the time, I really wondered how they made certain things. I couldn’t believe the kinds of images and animations they were able to achieve, using the given specs. You were able to understand that because you were programming the PC. The Famicom system is like a toy for the family, but the images were smoother than on the PC and it reproduced arcade games very well. And that made you wonder how they did it? That’s right. I was so impressed that I started to play the Famicom system. So, I started playing it a lot later than everyone else. Since everyone was playing Donkey Kong5 or Mario Bros.6, I started gathering those game cassettes. But my interests weren’t in regard to the games but the technology. At the time, Sharp Corp. had a computer called the X1, which was very good at managing VRAM.7 I tried using it to recreate that by disassembling software sold at the time.8 5 Donkey Kong: An action game released for the Famicom system in 1983 in Japan. 6 Mario Bros.: An action game released for the Famicom system in 1983 in Japan. 7 VRAM: Video Random Access Memory. The kind of memory that stores the visual data that is shown on the screen. 8 Disassemble: To inverse machine language (lists of numbers) to assembly language written in texts that are readable by humans. A type of programming language which corresponds one-to-one with a language that the computer can interpret and execute directly (a machine language). The language closest to computers. Disassembling! Wow, that really brings back memories. I remember getting my first computer, which was a PET, and disassembling it to try and analyse it. We didn’t have printers at the time, so I rewrote everything on the screen by hand. I really can’t believe I did that. (laughs) That’s how I found out what was going on inside. It just so happens that a computer and the Famicom system had the same CPU. 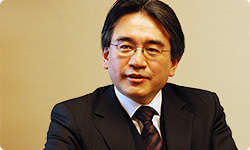 That’s why when I started working with Nintendo, I knew about the 65029 better than anybody else in the company. 9 6502: The CPU used in computers such as Apple II or PET 2001. The Famicom system had a CPU that was compatible with it. Oh, I see. (laughs) Thanks to my learning of programming back then, I’m able to understand the basics of what the programmers say. It’s really useful during debugging. When a bug occurs, you’d start to get a feel for what exactly is causing it. You’d also get a feel for which parts of the programming you should and shouldn’t touch.